Everyone loves mountain gorillas. 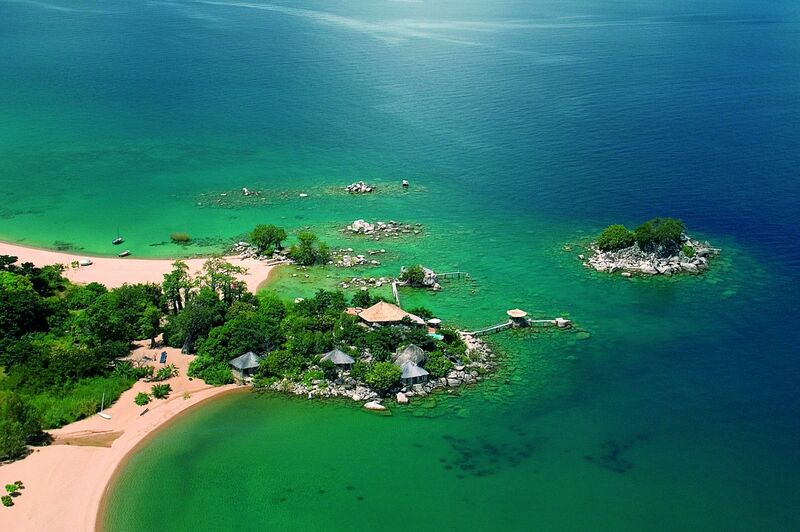 They live in a landscape akin to Eden, along the Western, or Albertine Rift, in one of Africa’s most biodiverse regions. 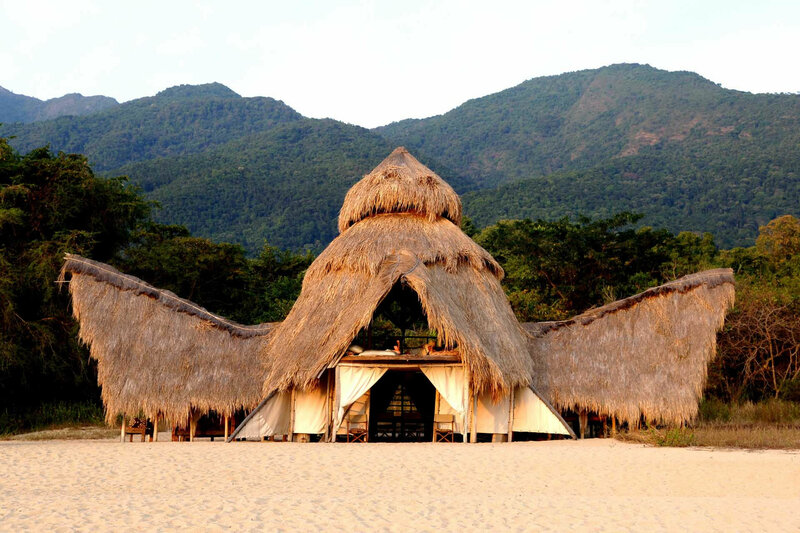 In this haven of rainforest endemism the most celebrated wild mammal is the iconic mountain gorilla of the Virunga Massif. 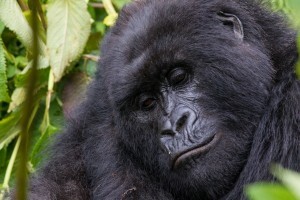 Spending half of the day eating, gorillas spend another third of their day resting. In between they take gentle walks through the forest by babbling mountain brooks, stopping every now and again for a family picnic, foraging the finest raw, vegetarian whole foods and insects with the occasional small mammal treat. Siesta comes at midday and whilst their youngsters play freely, the elders will casually snore away, post a morning of foraging – it could almost be a scene from a family Christmas Day! It’s their social time too and the group interacts most during these rest periods. A great deal of time is spent teaching and playing with their nearest and dearest. Playing has a very important role in the life of young gorillas and in their integration into the group. It helps the children to get familiar with every single animal and to be accepted as a part of the group. During playing they practise communication and learn many patterns of behaviour that are not instinctive. Watch John as he experiences the thrill and wonder of young wild mountain gorillas curiously touching his face and hair in this video clip of a gorilla encounter. Gorillas get a full blissful eight hours of beauty sleep unless of course the weather is cold and overcast when the whole family has a lie in. They do this every day, not just Christmas. A nice life, but nothing like mine, or perhaps yours. Well perhaps a few thousand years ago when the average Neolithic man spent just two and a half days working, the rest of the time it was free for his own hobbies. According to the ancient burial archaeological finds Neolithic man was a supreme craftsman – he had a lot of spare time on his hands to make things and invent. Gorillas are not so much the master carpenters, but they do make their own beds daily (nests) leaving more time for contemplating his odd cousins from the lowlands. “a silverback gorilla and a leopard were both found dead from mutually inflicted wounds”. Man isn’t typically a direct threat in terms of poaching, as gorillas are well protected by dedicated rangers, but gorillas habitat is under pressure from communities for farming and charcoal production. How do gorillas ‘father’ their children? 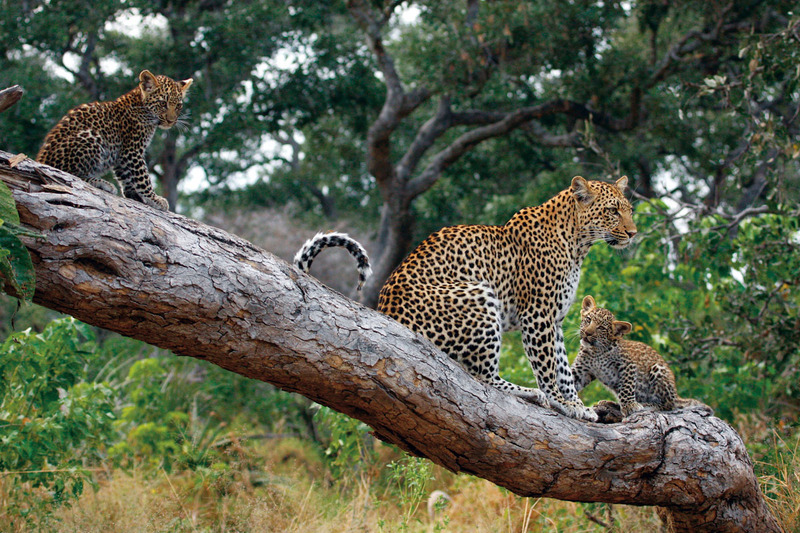 Young animals always search out the group leader who usually is their father as well. They frequently stay close to him, they lean on him and include him in their games. For them a close relationship with their father can be vital. He protects the infants and his care increases their chances of survival if their mother dies or if she leaves the group. In such a case the silverback male is usually the only one who looks after them intensively. He even allows them to sleep in his nest. 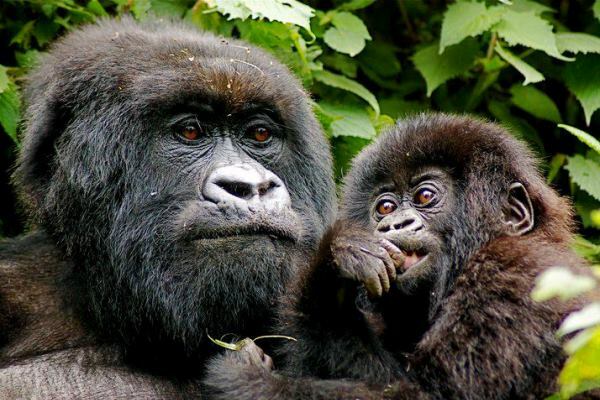 How do gorillas ‘mother’ their children? Mountain gorillas practice ‘attachment parenting’, the mother gorilla holds the baby close throughout the day until they are three years old, at which point the baby can be independent and the mother can choose to have another baby. 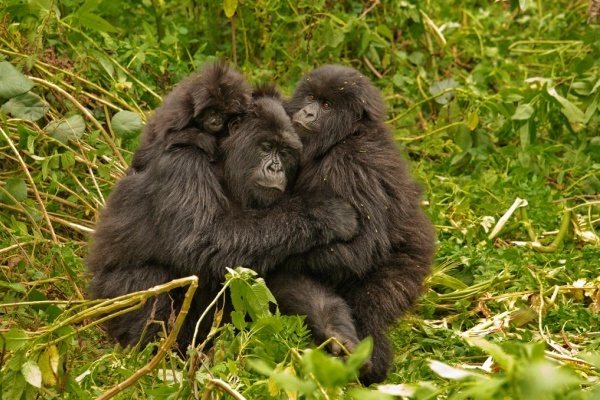 Unlike the fathers, mother gorillas do little teaching, they are the caregivers while the fathers are the teachers. Gorilla trekking is often described as “life changing”, seeing these gentle creatures in their natural habitat is a unique experience which aids conservation through the income from permits. Rwanda is home to 302 gorillas, close to 35% of the world’s population. 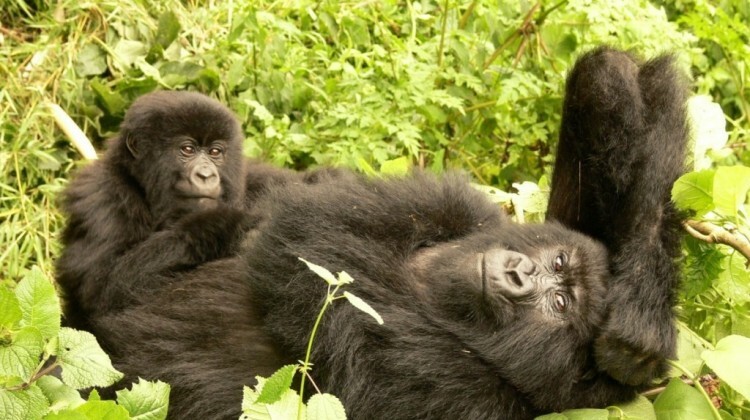 There are 18 families of gorillas in the country, with 10 families visited by the tourists in the Volcanoes National Park in northern Rwanda, just 2 hours drive from Kigali. You can visit our evolutionary cousins in Eden, it is still there in Rwanda. 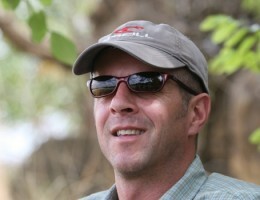 The Aardvark Safaris team has lived and worked in Africa, many have done a gorilla track in Rwanda and can help get you in the right place at the right time to maximise the enjoyment and diversity of wildlife. All you need to do is email us or call us to spend an awe-inspiring hour whilst the gorillas go about their daily lives.